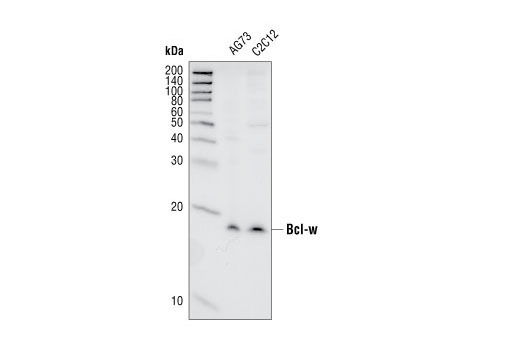 Bcl-w (31H4) Rabbit mAb detects endogenous levels of total Bcl-w protein. 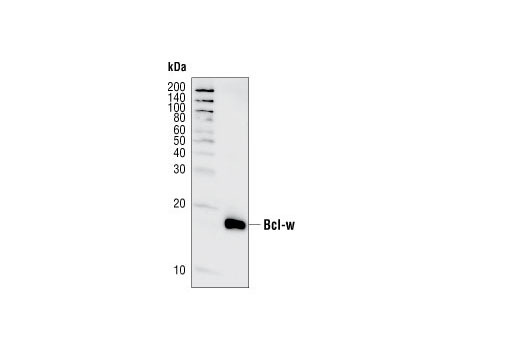 Monoclonal antibody is produced by immunizing animals with a synthetic peptide corresponding to residues surrounding alanine 39 of Bcl-w. The pro-survival protein Bcl-w was originally identified in a PCR-based strategy aimed at discovering novel Bcl-2 family members and was found to be expressed in cells of myeloid origin, as well as many other tissues (6,7). Most tissues from bcl-w knockout mice were unaffected, but male mice did show defects in seminiferous tubule organization and spermatogenogenesis (8,9). Gibson, L. et al. (1996) Oncogene 13, 665-75. O'Reilly, L.A. et al. (2001) Cell Death Differ 8, 486-94. Print, C.G. et al. (1998) Proc Natl Acad Sci U S A 95, 12424-31. Ross, A.J. et al. (1998) Nat Genet 18, 251-6.